Although little is known of his early life—which throughout his career Cendrars kept secret—it is known that he was born Frédéric Sauser in 1887 in La Chaux-de-Fonds, Switzerland. During his infancy he lived, perhaps, in Egypt, and in his later childhood, more certainly in Naples. After education in England and Paris, Sauser returned in 1907 to Switzerland as a student in Basel, moving perhaps to Leipzig, and then to Bern. By 1910 he found his way to Paris, where, with fellow student Féla Poznaska, he translated letters and documents. Among the artists he met was Marc Chagall, but basically Sauser was a failure in the art and literary worlds. For lack of funds, Féla was forced to visit relatives in the United States, while Sauser traveled to Saint Petersburg. Working as a language teacher, he attempted to return to Paris, but was unable to find the money until Féla mailed him a boat ticket for New York. Living for a while with Féla's relatives in the Bronx, Sauser met the opera singer, Enrico Caruso and visited Stieglit's galleries at 291; but the New York stay only reconfirmed his need to return to Paris. To make ends meet, he played the piano in a Bowery movie house, while Féla taught at the Ferrar School, founded by anarchist Emma Goldman. In New York Sauser took on the name of Blaise Cendrars, returning to Paris via Switzerland. Over the next two years, Cendrars was active in the great avant-garde scene of the day. He worked with Guillaume Apollinaire, had poems published in journals, and made close friends with Fernand Léger, Robert and Sonia Delaunay, the boxer Arthur Craven, and others. His closest drinking companion was Modigliani. Cendrars was active during this period in exhibitions and readings from Saint Petersburg to Berlin. Panama and Elastic Poems were also written during these years; and a son, Odilon, was born to Féla and Cendrars in 1914. 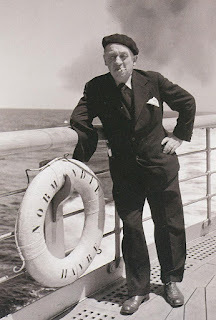 A few days later, Cendrars was on his way to join The Foreign Legion. In 1915, assaulting the Naavarin Farm in Champagne, Cendrars lost his right arm, and returned to Paris. At first the city was culturally deserted, but gradually poets and artists returned, and Cendrars was again involved in poetry readings and concerts with Apollinaire, Max Jacob, Pierre Reverdy, Erik Satie, Darius Milhaud, Arthur Honegger, and others of the avant-garde. In 1917, however, he left Paris with Féla and his two sons for the small town of Méréville, where he wrote The End of the World Filmed by the Angel of Notre-Dame and other works. In the same year, Cendrars began to move apart from his wife, traveling to Cannes where he worked with the great film director, Abel Gance, eventually serving as his assistant on La Roue. Later, with the help of Jean Cocteau, he became the artistic director of La Sirène Éditions, where he published contemporary authors alongside authors such as Lautrémont and de Gourmont. From 1912 to 1924, Cendrars also traveled to South America five times, lecturing in Brazil and other countries. During these years he completed his poetic activity and turned to fiction, writing Sutter's Gold in 1925, Moravagine in 1926, and Dan Yack in 1929. During the 1930s he continue writing, mostly as a journalist, reporting on Hollywood and popular figures such as O. Henry and Al Capone. At the end of the decade, however, he returned to writing fiction, first with Histoires vraies (True Stories), La Main coupée (Lice), L'Homme foudroyé (The Astonished Man), Bourlinguer (Planus), and Le Lotissement du ciel. Green Integer published Cendrar's three plays, Films sans images, performed between 1954 and 1956 (available in book form and a PDF file from Green Integer). The dream of the BREASTS is coming true! Reprinted from Complete Poems, trans. by Ron Padgett, with an Introduction by Jay Bochner (Berkeley: University of California Press, 1992). Copyright ©1992 by Ron Padgett. Reprinted by permission of the University of California Press.